Free and open source software has a lot to offer research scholars and higher education students in carrying out their academic activities in an efficient manner. These tools assist in surveying the literature, managing references, drafting manuscripts and theses, making presentations, building graphical illustrations and in collaborating with peers. Scholarly research is a dynamic and complex activity. It incorporates various components that require high levels of cognitive skills. Similar to other aspects of life, the research domain has also benefited a lot from IT tools. Any one associated with academic research is well aware that usually, only a limited budget is allotted to IT tools. In such a scenario, getting commercial and proprietary IT tools is difficult from both the financial and procedural perspectives. Free and Open Source Software (FOSS) performing research tasks has been a big boon for academic researchers. Let me make it clear that the FOSS tools featured in this article have not been selected only because of near-zero costs, but also for their professional features which are on par with their commercial counterparts, if not better. One important task that’s repeatedly carried out by scholars is collecting information from existing literature. ‘Search – search again and re-search’ constitutes the major chunk of the work in academic research. By the term ‘searching’ I don’t only refer to the simple task of searching in a search engine as carried out by regular users. Here, ‘search’ implies the task of collecting information from various sources. Of course, the first step in this process is searching in specialised search engines such as Google Scholar and Microsoft Academic. The crucial component is how to collect and organise the results returned by these search engines in response to the user query. To carry out this step, various tools are available, from which Zotero has been selected. The Zotero workflow is as follows. You navigate to the Results page of an academic search engine or any page that contains your research content. Zotero comes loaded with various components that sense the presence of research content on a page. If sensed, automatically an icon with the Zotero logo is shown in the browser. By simply clicking on this icon, the metadata associated with that content is automatically added to your Zotero repository. While you are writing a paper, you can directly insert this reference, by searching in the Zotero word processor connector plugins. These plugins can be installed either manually or automatically. Drafting a manuscript is another big task. Though any word processor can be used to draft manuscripts, there are some inherent limitations in this approach. As stated earlier, converting a manuscript from the style template of one journal to another is a task that cannot be automated if you simply go with the word processor approach. To rescue scholars from the burden of such laborious tasks, we have LaTex (usually pronounced as Lay-Tech). It is a typesetting system for creating production quality output. While the word processing tools follow the ‘What You See is What You Get’ (WYSWYG) approach, LaTex uses an approach similar to markup languages such as HTML. Here, a clear demarcation is made between the content and its style. The authors can concentrate more on the content. Production of professional quality output, as per the style selected by the author, is carried out by the LaTex software. It is obvious that getting familiar with LaTex requires some initial extra work by the authors. However, it is worth going through this learning curve, as the benefits are huge. This LaTex document belongs to the class called ‘Article’. There are other classes such as ‘Report’. The title for this article is ‘Sample LaTex Article’. The author’s name is ‘K S Kuppusamy’. The date of this article is ‘01 Jan 2018’. The main body content is ‘Hello world!’. It is easy to understand the source of the LaTex article. The major benefits of using LaTex are listed below. It can be used to create journal articles, reports, books, theses, etc. LaTex is very good in handling larger sized content. With the traditional word processing tools, managing a 300-page document with many tables and figures can be tricky. Even a simple change in one place will have difficult-to-track cascading effects in various other places. In the case of LaTex, the professional rendering of content with proper alignment is now the task of the LaTex engine and authors need not worry much. Managing linked references is very simple. For references, you can explore BibTex. If your document consists of mathematical formulae, then LaTex should be your first choice. The rendering of formula and other scientific notations/symbols is handled excellently by LaTex. LaTex offers support for managing many languages. For multi-lingual documents, LaTex can be very handy. Incorporation of pictures/images and their alignment issues are handled professionally by LaTex. A gallery of diagrams supported by yEd is available at https://www.yworks.com/products/yed/gallery. yEd can be either installed in your system or a live online version can be used. Networking is important for a good scholarly researcher. Information technology tools make it easy to communicate and collaborate with peers. In addition to the normal social networking tools used by everyone, there are some specific options for researchers to communicate and collaborate. A few of them are listed below. Academia (https://www.academia.edu): Academia is a free and simple way to share your research. One of the advantages of using this collaboration tool is that by reaching the right peer, there is a better possibility of increasing the citations. Researchgate (https://www.researchgate.net): Researchgate is a simple and effective platform to share your research papers and details about the projects that you are working on. It enables you to gather insights into your peers’ work at the global level, and get hints on the progress of their current research projects. In addition to the general-purpose tools explained above, there are some scientific computing and analysis tools. Enumerating the complete list of all such tools is out of the scope of this article; however, Table 1 features some of them. As stated at the beginning of the article, it would be impossible to cover all the tools that enhance scholarly academic research. 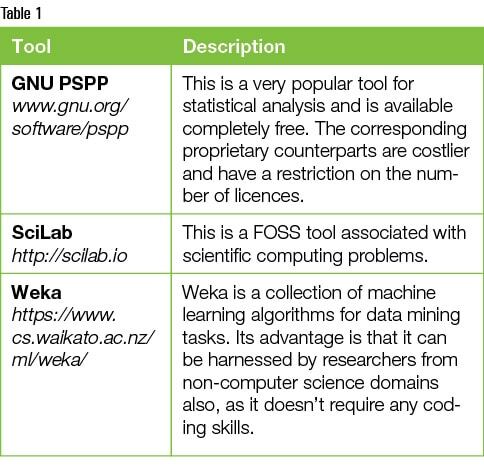 This article has just thrown some light on the various dimensions of academic research and the corresponding FOSS tools that can be used to improve research productivity.